Pocket Crosses and Magnets too. Over the years, there have been several requests for a cross-themed piece for those who do not wear necklaces or pins. Since their introduction a few months ago, the positive feedback has been overwhelming! 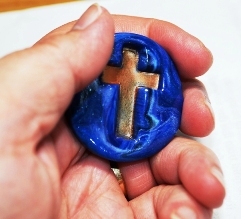 Handcrafted by Deborah, the "Cross in My Pocket" medallion is approximately 1 1/2" in diameter and is made from lightweight and durable polymer clay. It feels wonderful in the hand and can be popped in a purse or pocket. If you prefer a magnet backing, just let us know. These lovely medallions are great thank you gifts and make terrific fundraising items for any school effort. 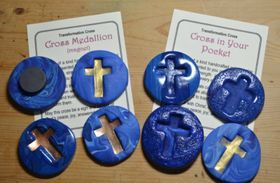 The pocket crosses are available in blue tones and earth tones only. Every one is different. Some have the crosses highlighted in gold. Some are texturized. Each medallion comes with a prayer card in a clear cello envelope. The retail price for one medallion is $10 plus shipping. With a minimum order of 25 crosses, they are available at the wholesale price of $5 ea. And, if you prefer the magnet backing, we're offering it at the same price for a limited time. Please note that you can order as many crosses as you wish over 25 pcs (ie. 36, 58, 73 pcs) for the discount. Just call Deb if it is not a multiple of 25 that you are ordering. Call 905-468-9502 to place your order with a credit card. We also accept electronic money transfers, cheques and money orders. Purchase must be made at time of order. 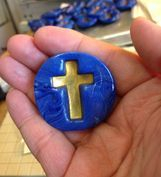 Please specify if you wish pocket crosses or magnets - or a combo of both and your choice of brown or blue - or a combo of both.